The skin and the face are among the first things that a person displays about themselves. The color, brightness, and smoothness of skin can showcase good health and proper beauty care; good skin can also project warmness, openness, personality, and friendliness. Skin is also, unfortunately, one of the first parts of a person’s body to suffer due to hormone imbalances, stress, bad diet, and a negative environment. Therefore, the wide field of skin care products offers everything from creams, soaps, and masks, to more clinical solutions available to physicians and cosmetic surgeons. Understanding skin care products can be difficult, and evaluating the quality of various products can be confusing. Here, Dr. Vu wants to help patients understand a couple of skin care product lines so they can be better informed as to their options. La Maison Clayton Shagal is a Canadian based manufacturer with an advanced and effective suite of skin care products that focus on building up the fundamental structure of healthy skin to produce better aesthetic results. Clayton Shagal maintains a line of products that utilizes a three-part combination to address the components of skin: Collagen, Elastin, and Moisture. Their collagen products build up a base of macro-proteins in the skin; these products are derived from a pure collagen extraction formula developed by Clayton Shagal more than 30 years ago. Their Elastin products provide the skin with the necessary addition of elastin proteins that maintain the skins pliability and elastic properties. Their final product line is a suite of creams that moisturize the skin with a soft and gentle formula that exhibits impressive moisture-absorption and moisture-retention properties. At California Aesthetic Center, Dr. Vu uses the clinical line of skin products by Clayton Shagal as part of his host of treatments to provide excellent aesthetic results far beyond what home care can produce. Huntington Beach Plastic Surgeon Dr. Vu also utilizes a line of clinical products by ZO Skin Health, a company founded by board-certified dermatologist Dr. Zein Obagi. Dr. Obagi’s products were designed by a physician with physicians in mind, and are formulated based on the experience and knowledge of a world-renowned skin care expert with multiple awards, inventions, and published books to his name. Dr. Obagi’s product philosophy focuses on creating and maintaining healthy skin for life. At home products start with cleansers to clean skin, exfoliators to open and polish pores, and toners to balance skin pH levels; all of these are to prepare skin. Home treatments then address numerous skin issues from a line of products, and office treatments augment these home products with powerful formulas. Finally, a number of creams keep the skin healthy and moisturized to lock in previous treatments and prevent skin degradation. At California Aesthetic Center, patients receive only state of the art procedures and top of the line products, because Dr. Vu knows what works. 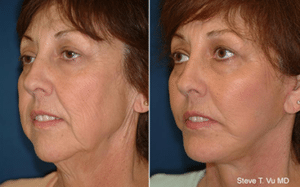 The products discussed here are only some of the treatments available to patients at California Aesthetic Center. For people in and around the Huntington Beach, Corona, or Temecula areas seeking professional skin care help, call (714) 848-1133 today for a consultation to discover what Dr. Vu can do for you.